hi! this is me and my little family at the jersey shore last month. I love all things paper, especially card making and calligraphy. I serve people through food. I love cooking new things and sharing them with others. I want to host you in my home for dinner, ever single night. Unexpected guest always have a place at the table and a full plate of food. In fact, I could probably feed the entire crew of Influence Conference ladies by what is in my pantry alone. being with you all! I seriously can't wait to meet so many of you. soaking up the inspiration you exude. blogging can get a bit lonely right? I am excited to be with other bloggers and more importantly Christian bloggers and be inspired by all of your adventures and endeavors! my sunglasses. they sit on top of my head from sunrise to bedtime, even indoors, even after dark. they are my perfect accessory, holding my hair just so. Are you going to influence too? Let me know in the comments. I would love to know! I still want to know more about you. Feel free to share a bit. p.s. I am selling some of my well-loved, but barely worn clothes to help pay my way to influence. Check out my shop! And even more items will be posted later this week. Hey Shannon! Looking forward to meeting you in a few weeks! I too am a city girl and I am a big fan of DC. I lived in NYC for a few years and miss it so much. I'll look for the girl with the sunglasses on her head and then I'll come say hi:) See you soon! Hi, Shannon! Nice to "meet" you! I love all things paper--it's probably why I first fell in love with writing. Love your cute blog, and look forward to meeting you at the conference! I wish so so badly that I was able to go to the conference. I couldn't get time off of work. Maybe (Lord willing!!!) next year i'll be joining you! I won't be at the conference, but I had to tell you I love that photo of the three of you :) So adorable! I'm attending the conference-hopefully we'll be able to meet in person! I am also a city girl who loves all things paper! I could spend a fortune in Target's stationary aisle. I'm looking forward to meeting you! I am so jealous you're going to this! I'd love to be there but I'll settle for reading all about it from you! I am always loosing my sunglasses- maybe I should try wearing them on my head more often! Excited to meet you! I believe you and I are going to get along very well. See you there! I with you on loving people through food- that's been the hardest part of living alone so far... nobody to share with yet! Excited to meet you at Influence! You have a lovely family! I found ya on the Facebook blog hop. I'm following ya on twitter & your blog. I hope you have a great week. I can't wait to meet you and everyone else at the conference!! Yes yes yes! I know I'm super-behind on meeting everyone but I wanted to say hi! 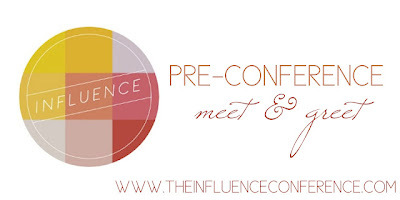 Looking forward to meeting you at Influence! 2 1/2 weeks!